In Jamaica, subsistence fishing has been a way of life for centuries. The oceans once yielded generously to those dependent on its riches, particularly in Bluefields Bay where fish life was plentiful a century ago. But without environmental regulation of its once-teeming waters, its habitats are now devastated by trolling nets, poor fishing methods and the destruction of mandrake swamps that once sheltered fish. Though there is no official world ranking system for overfishing, Jamaica is said to harbor the most overfished waters in all of the Caribbean. 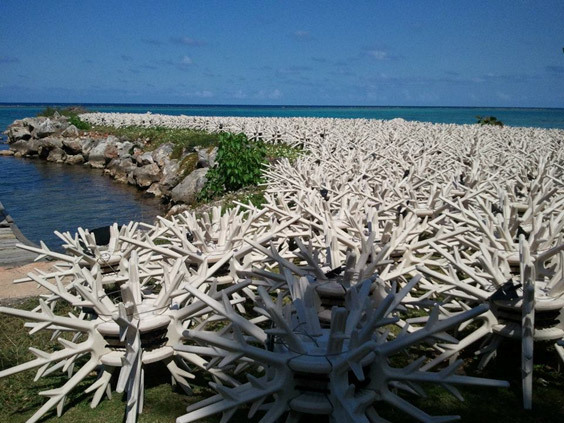 The damage done to the coral reef and felt by local fishing villages awakened the nation to its own ecological crisis. As with most fragile ecosystems, the damaged coral reef held grave implications for fish populations that once grazed its underwater gardens. Among those most concerned were the fishermen whose nets turned up chronically empty year after year, until they decided to take the problem into their own hands. A group called The Bluefields Bay Fisherman’s Friendly Society lobbied the Jamaican government for several years before Bluefields Bay was granted protective status as the largest marine sanctuary in Jamaica. These same waters once thick with fishing boats are now patrolled by wardens with a watchful eye out for fish poachers and those who would threaten the reef’s slow healing. As it was, more than one interested party had set its sights on the restoration of Bluefields Bay reef. In late 2011, a company called EcoReefs® conducted a large-scale installation of artificial starter reef in the waters of Bluefields Bay. Their hopes to recruit a healthy fish population coincided with those of Bluefields Bay Fisherman’s Friendly Society. EcoReefs® took an unexpected hand-up in the Bluefields Bay Installation from an American-made product called the Man Saver Post Driver®. A product engineered for fence post driving in the rocky soils of American ranch lands was repurposed to hammer the reef modules into place during the installation. 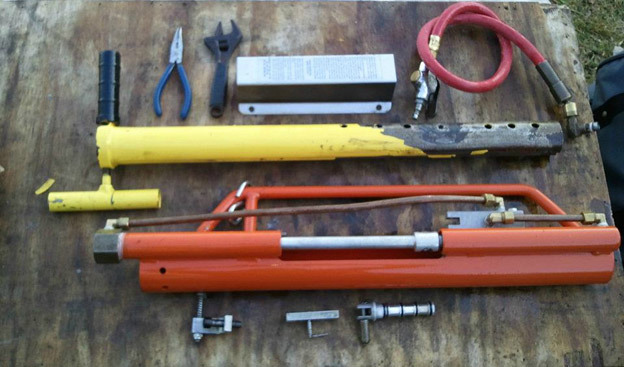 The post driver is the invention of Oregon entrepreneur Dan Rohrer of Rohrer Manufacturing who sought to save many a farmer’s aching back from the grueling labor of remote fence post installation. His philosophy? Make it easier to get the job done. Doing the work of two ranch hands at once is the trademark of Rohrer Manufacturing’s air-powered dream tool. It boasts big power from compact engineering and is said to help ranchers work smarter, not harder. EcoReefs® modified version of the Man Saver Post Driver is customized for underwater use with slight modifications to the outer sleeve of the air-hammer to prevent rusting from water leakage. In Jamaica’s Bluefields Bay Fish Sanctuary, the Man Saver Post Driver operated from an air hose run to the floor of the reef, powered by an air compressor located on the boat. EcoReefs® ongoing projects span the USA , Arabian Gulf, Southeast Asia and the Caribbean. In the critical restoration of Bluefields Bay and other global reefs lies the health of our future oceans. Find out more about the invention that is changing Jamaica’s reefs and learn about the Man Saver Post Driver’s helpful on-land uses. This See the Man Saver Post Driver in action on YouTube, on Facebook, and find more information on how to purchase.